On the third day of Christmas, I finally went to the post office. Yes, yes, I KNOW. In my defense, I have some kind of sinus thing coming on, and I’m on that immunosuppressant, remember? So, avoiding crowds is what I’m SUPPOSED to be doing… five holiday concerts notwithstanding. Anyway. I am painfully conscious of being overdue in mailing my friend Sarah’s holiday box. Not just this year… her box from last year. No, really. I started shopping for my good friend and blog partner at Wonderland summer 2016, and then put those small items aside in the closet, because after the election and following shenanigans, I… couldn’t… pull it together… enough… to get to the stuff into a box… and to the post office. Two. Blocks. Away. Look, the end of 2016 was rough, okay? And, 2017… was more nonsense, and then we moved, and …more chaos. Heat wave. More piles of crud. Then I got sick(er). So. So, today I have DECIDED: clean slate. To the post office we go. Let’s get this taken care of. I feel hopeful, having Peter with me. 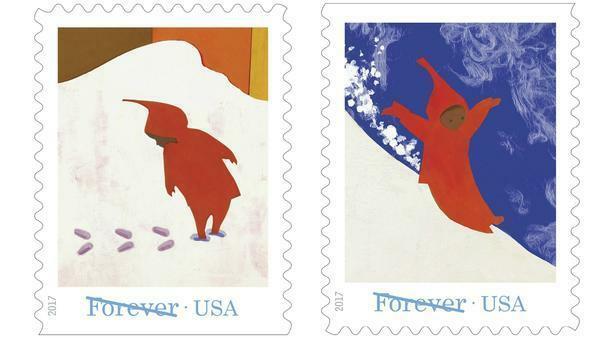 I hope you take a minute to read Andrea Davis Pinkney’s piece on the special significance to her of the memorial postage stamp from THE SNOWY DAY. (She talks a bit about her own book celebrating the original book as well.) I wasn’t born when THE SNOWY DAY came out – I really didn’t read it ’til college – but there’s still something magical about the commonality of one small person enjoying something as simple as a first snowfall. Of greater significance is that he’s one small black person, and that the book was published in a day and age where a book with a black person on the cover was seen as something impossible to sell. Oh, yes: there are publishers who still believe that. To this day. Even after the 90’s, when there were a lot of shows on TV which had fully non-white casts. Even after the successes of myriad books and movies, the winning of awards… even after all of the successes people of color have had outside of the arts… there is always a backlash. Three steps forward, two steps back. All the progress disappears because there are people who insist that “the world” simply isn’t “ready” for these “new” ideas. The more fools, they. Change comes slowly, but it does come. Arise and shine – and be ready to greet a new day.